The Timer Settings screen allows you to select electronic timers, COM port, results printer, and other settings. The first time you click Enter Results, this screen will appear, and you can also click Timer Settings on the Enter Results screen to bring it up. Choose whether you are using FINA/USA Swimming rules or NCAA/other rules for differences between pads and backup times. See Timer Adjustments Rules Preference article for more info. Select your primary electronic timer. The Timer Assistance button offers more info for the timer selected; see "Electronic Timers" in TouchPad help for detailed info. Selecting a timer will cause timer controls to appear in the lower right corner of the Enter Results screen. Select the COM Port the timers are using (click Find COM PORT Number button if you need help with this). If you are using a BestBET, Colorado 4/5/6, Daktronics, or Time Machine timer, choose the correct COM port and click OK. Then click Test or Test / Choose Meet to ensure it's working. 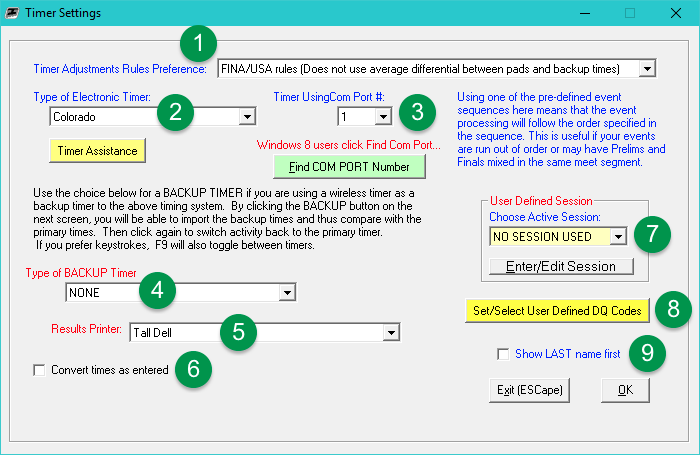 Select your backup timer if you have one. Choose a different Results Printer, if desired, than the one defined on Meet Setup. When you check this box, an explanatory dialog will appear (click OK to dismiss), followed by an Enter Conversion Factor field. Enter a multiplier, such as 0.875, to convert 500 yard times you enter to 400 meters. Choose a session if desired, and the event processing will follow the order specified in the session as described in the blue text above the dropdown. Click to open the DQ Codes window and add/delete those codes. Checking this lists the athletes on the Enter Results screen with the last name first.